Scarier, darker, unexpected – three buzzwords that you’d typically associate with one of Hollywood’s blockbuster sequels and sure enough, Chris Pratt has cited all three when previewing Jurassic World 2. Screen Rant caught up with the A-lister in anticipation of Guardians of the Galaxy Vol. 2 – May 5th is the date for your diaries – and Pratt began by directing praise toward Juan Antonio Bayona. Best known for his work across The Impossible and last year’s poignant tear-jerker, A Monster Calls, Bayona picked up the torch from Colin Trevorrow after the latter veered toward Disney’s galaxy far, far away. Trevorrow is still involved in Jurassic World 2 though, having hashed out a screenplay alongside long-time writing partner Derek Connolly. And after J.A. Bayona himself promised to up the ante with Universal’s 2018 sequel – not to mention Bryce Dallas Howard’s (Claire) comments about a more “suspenseful and scary” thrill ride – Chris Pratt has echoed that sentiment by telling SR that Jurassic World 2 will carry the story forward in a “way that is really unexpected.” It’s worth keeping in mind that the studio is angling Bayona’s blockbuster as the second part of a bona fide trilogy, so it’ll be interesting to find out what Chris Pratt really means when he says that JW2 will subvert expectations, in a manner of speaking. Aw man, J.A. Bayona? Do you know that filmmaker? He’s a remarkable filmmaker. If you haven’t seen The Impossible or A Monster Calls, I mean he’s really visually masterful. Deep emotions and suspense. I think it’s going to be a scarier version. A little bit darker and will continue to expand and carry the story forward in a way that is really unexpected and you wouldn’t have imagined. 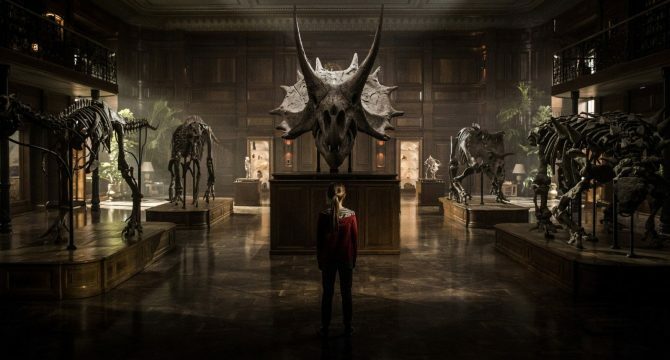 Poised to tackle themes of animal abuse and dino creation run amok (read: open source), Jurassic World 2 is earmarked for launch on June 22nd, 2018. Next up for Chris Pratt is Guardians 2, before James Gunn gets the band together for the inevitable Guardians of the Galaxy Vol. 3 further down the road. It’ll seemingly have a huge bearing on Marvel’s Phase 4, one that Gunn is set to be heavily involved in henceforth.